To be fair, I thought I should warn readers of this review that it's fairly spoiler-ish, more so than usual, even for me. 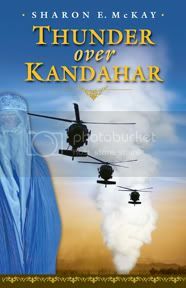 If you want to know, in short, what I thought of the book I can only say that it's an action-packed young-adult melodrama exploring the oppression and hatred of women in modern-day Afghanistan. I happened to read this novel back-to-back with Words in the Dust by Trent Reedy, and much preferred the latter. Okay! On to the full review! Yasmine is very unhappy about her parent's decision to return to Afghanistan. Having been raised in England her whole life, teenaged Yasmine finds the idea of leaving Britain daunting. Her parents still have so much love in their hearts for the beautiful mountains of Afghanistan, though, and they feel that it's up to people like them: educated, liberal, native Afghans, to reclaim their country and help rebuild it. On the whole, this is a fairly unsympathetic look at the culture of Afghanistan. Yasmine's complete ignorance of local customs provides the perfect excuse to give readers plenty of exposition. Living in a city, the family suffers the claustrophobic effects of coping with Taliban edicts, enforced by brute squads of local bullies. Yasmine is initially dismayed that she must cover her hair at all times. Soon though, she misses her old veil, when the new restrictive burka, allowing only a narrow strip for her eyes to peep through, is demanded. Before she knows it, her pretty blue burka with silver thread is also considered "too immodest" and she is forced to trade with an old beggar woman for a plain yet filthy burka. When her mother is beaten within an inch of her life for singing in the street (women are supposed to be silent) and no doctor will see her, the family decides to retreat to the Afghani countryside. It's extremely lonely there for Yasmine, and her father hires a local village girl, Tamanna, to be her companion. Tamanna leads a difficult life, with a brute of a father. Yasmine teaches her to read. The girls are excited that a new school is being built, and here the fast-pace and melodramatic events truly start to pick up. No sooner do they meet with some friendly American soldiers who are setting up the school, but they are intercepted by a Taliban raid... led by no other than Tamanna's long-lost brother. Dramalicious enough for you? It gets better. Tamanna wants to escape her arranged marriage to a man old enough to be her grandfather and in all the confusion and fighting, the girls try to make an escape. Friendly French forces are delighted to meet a "local" who speaks perfect English and carries a British passport. They put the girls in a cab, and the sexist cabdriver decides not to take them to their location. Instead, the girls are faced with an incredible journey through the mountains, on foot. They are once again reunited with Tamanna's brother, who confesses that he was made to serve as a "dancing boy" - sort of a male prostitute - by the Taliban but he's working his way back to respectability with the military missions they're giving him now, including a possible suicide mission. All of this backstory with the brother was a bit of a throw-away, and honestly deserved some more thought or attention. Yasmine hits her head and has amnesia. She is taken in by a nice family and changes her name. In the meantime, Tamanna uses Yasmine's passport to escape to England to be reunited with her "parents." Obviously, there is a lot here that stretches credulity with the twists and turns of this soap-opera plotline. I found it interesting that Yasmine, the only person seriously arguing that it would be a good idea to leave Afghanistan, is the only one who ends up staying. While the break-neck pace this book may draw in reluctant readers, on the whole, the flat characterization and lack of warmth or good sense from many of the adults in the novel make this a tough read to get through. For a more sensitively drawn portrait of a girl struggling with an arranged marriage in Pakistan I'd recommend Shabanu by Suzanne Fisher Staples, as well as the sequel, Haveli. For another recent take on modern-day Afghanistan, I'd recommend Words in the Dust by Trent Reedy.